If these class dates and/or times don’t work for you, please let us know. We understand that you have lives, and families, and work. We will work something out that works better with your schedule. Just let us know…. Incredibles 2 was ….Incredible! I think it was (almost) worth the wait! 🙂 ….and THANK YOU for coming out to the Client Appreciation event to see the movie with Chris Berg and I. We love these events, and we hope you do as well. Our next Client Appreciation will be Fantastic Beasts, and Where to Find Them…part 2. This is just our small way of saying, “THANK YOU” for your continued support, friendship, and oh yes, referrals. We appreciate YOU so much. . 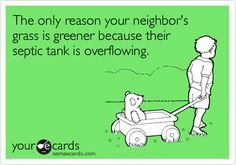 So, this week let’s talk about septic and sewer… this comes up quite frequently in our area….and it is important. This week we are going to talk about what people don’t like to think about in your home. Many areas in Clark County are still on Septic systems, and not hooked up to the Sewer. This, of course, makes sense in rural areas where you don’t expect sewer hook-up, but many places in Vancouver are still on septic as well as the sewer lines are not available there. However, sometimes the sewer line is there, but the home is still on a private septic system. I grew up on a septic system… both at my grandparents home that was on acreage & at my mothers home that was on a septic…in Vancouver, and by a hospital. It is surprising to some people just how many homes in Vancouver are still on a septic. For me, septic isn’t a big deal. It just has to be maintained, and as a homeowner, you have to be careful what you *ahem* flush. Homes with a septic shouldn’t have a garbage disposal as they aren’t equipped to handle that. What is a septic system? How Septic Systems Work A typical septic system contains two major components: a septic tank and a soil drainfield. The septic tank: ♦ Removes solids, which helps protect the soil drainfield from clogging that can result in premature failure of the onsite system. ♦ Digests a portion of the solids and stores the remaining portion. Up to 50% of the solids that remain in the tank decompose. The remaining 50% accumulates in the bottom of the tank as sludge. When the level of sludge exceeds the tank’s holding capacity, the sewage has less time to settle before leaving the tank. Eventually, the sludge level increases enough to allow solids to enter into the drainfield, resulting in damage to the field and the need for extensive repairs. The soil drainfield: ♦ Is located underground in an unsaturated soil area on your property. ♦ Further treats the effluent through physical, chemical, and biological processes. The field consists of a series of underground perforated pipes installed in a one-foot deep layer of washed gravel, or a series of plastic chamber units. Here, the effluent is distributed, stored, and ultimately applied to the soil for treatment. After filtering through the soil, the treated effluent enters the groundwater level for final disposal. A sewer system is, of course, is a city/county maintained sewage disposal system. The city/county is responsible for the care and maintenance of the sewage lines UNTIL it hits your property lines. Once all pipes hit your property line, the maintenance & repair responsibility is the homeowners. Maintenance of your septic system?The lack of septic tank maintenance can cause sewage to back up into your house or solids to overflow to the drainfield. Once solids overflow and leave through the tank outlet, they can quickly clog a drain field to the point that a new one is required. Most septic tanks need to be pumped every three to five years, depending on the tank size and the amount and type of solids entering the tank. The inspection of the sludge and scum levels is the only way to determine when a tank needs to be pumped. This is not necessarily a pleasant task, but can be done relatively easily. Septic tank pumping firms are available to perform the inspection. Your septic needs inspected every 2 years and that inspection on file with the Clark County Health Department. An average septic system needs pumped every 3-5 years. Now…just in case you haven’t noticed, I have shamelessly plagiarized parts of this email from the Clark County & City of Vancouver websites For more information you can go to the following websites: www.clark.wa.gov/public-health/propertyowners & www.cityofvancouver.us/publicworks/page/sewer-connection-incentive-program-scip. Well, that is this weeks crappy discussion! LOL …sorry, I couldn’t help myself. As always….this is just a quick overview…. again…and I can’t say this enough…please remember that your agent is NOT a salesperson, and should not be acting like one. Real Estate is not really about houses, it is about relationships. Your agent, and your lender work for YOU. You drive the bus…we are merely GPS to help you get to your goals. Like the classes, this weekly blog email is to help you with your home adventure. The goal is to be informative and non-promotional. 🙂 We are, however, hoping you will call and want us to help with your adventure. If you have any questions about this, or something you have heard…or if you would like me to help you with your home adventure, please call, email, text, or facebook me anytime. I am, as always, happy to help! Thank you again for your business and your referrals!! …and thank you for referring these classes to your friends, family, and co-workers. What are the ‘Hidden’ Costs of Buying a Home? …..
What if I don’t have a Down Payment? ….. &…. What happens after an offer is made? Last Week: Showing homes…things buyers & sellers should know. Next Next post: Holy Price Reducations Batman! Is Big Brother Watching? Well…maybe? ?